Living with chronic pain doesn’t just take a toll physically; it takes a toll mentally as well. Chronic pain can disrupt work, family life, and social engagements. Many orthopedic doctors are familiar with chronic pain symptoms, since the pain often stems from issues of the musculoskeletal system. If you’ve been living with untreated chronic pain, it might be a good idea to consult an orthopedic specialist. Narrowing down the source of the pain and setting up a pain management plan is an important part of relieving symptoms and restoring a sense of normalcy in your life. Pain management can take many forms. Below are some of the most common types of pain management treatment. Talking to your doctor will be the best way to come up with a successful plan. Drug therapy includes the treatment of pain with medication. This might include over-the-counter drugs or prescription medication. It’s generally preferable to try to manage pain with the mildest medication possible, so over-the-counter medications are usually a good place to start. Medications like acetaminophen and NSAIDs can help relieve pain and reduce inflammation that might be causing pain. Topical pain relievers in the form of creams, lotions, or sprays can sometimes be effective. If over-the-counter medications don’t seem to be enough to manage the pain, talk to your doctor and he or she can talk to you about prescription pain medication options. It’s always important to understand any risks or side-effects that are associated with drugs you’re taking, even over-the-counter drugs. In some cases, your doctor can use injections to help manage your pain. If trigger points in your muscles are painful, trigger point injections can help the knotted muscle relax and relieve pain. Steroids or other medications can be injected into swollen joints to reduce inflammation. A nerve block is another injection option. This injection numbs the surrounding nerves. This isn’t always a viable option, so consultation with your doctor is key. While relieving pain is important, working on the underlying problem to find a permanent solution should be the goal. Physical therapy uses special techniques, exercises, and stretches to help improve problems caused by a disability or injury. Movement and function can often be improved with physical therapy, leading to less pain and a better outlook for the future. Physical therapy exercises should often be continued even after scheduled meetings with the therapist have ended. Exercise can also be an important part of managing pain. While you may need to take a break from strenuous exercise to allow for healing, studies show that resting for too long or living a mostly sedentary lifestyle can increase your risk for chronic pain. Mind-body therapies focus on the mind’s ability to affect the physical body. Learning techniques like meditation, visualization, relaxation, and biofeedback can help you manage painful symptoms naturally. Studies have shown that these techniques can be effective if practiced regularly and properly. Some pain is stress related and these techniques are particularly effective at managing this type of pain. 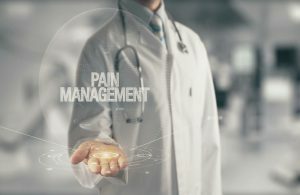 Most pain management specialists in Jacksonville, FL, will use a combination of pain management therapies and techniques that are tailored to your unique situation.